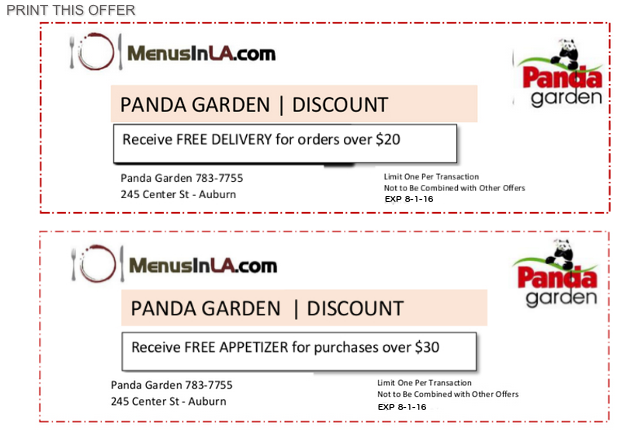 Click on the coupons to open & print! 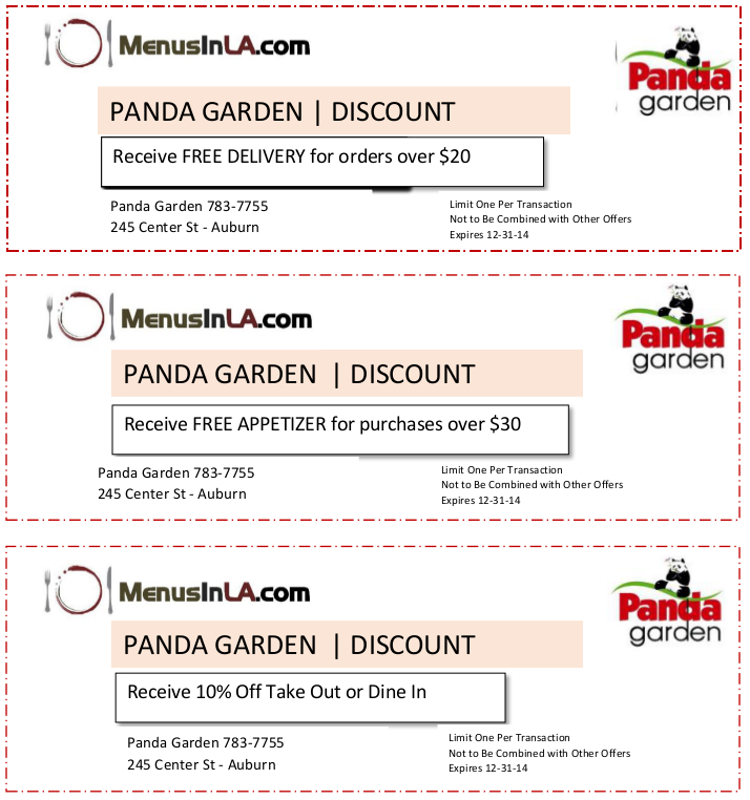 Panda Garden in Auburn Maine is known for serving all your favorite Chinese food including General Tso’s, Hot & Sour Seafood Soup and Garlic Chicken. We have a lot of appetizer choices and an exotic range of Polynesian Drinks available at our bar. Check out our lunch buffet served everyday $6.50 or our dinner buffet Wednesday-Sundays $8.95. My children and I visited the buffet approximately one hour before the buffet closed. We should have looked before sitting down. I have NEVER left a review on a restaurant before, but this was so horrible I felt inclined to do so. We walked up to the buffet and all of our faces immediatly at the same time dropped. Literally 80% of the food (and not a big selection as it is) was gone. What was left looked like something out of an ad for food gone bad. HESITANTLY, we tried what was left. (I felt bad for the waitress at this point.) It was just as bad as it looked. It was cool to the touch, rubbery, stale, and every other unpleasant word you could possibly use to describe food. The waitress tried very hard to make it better by telling us that anything we wanted that was on the buffet we could ask for and she would have the person out back make it for us. We figured chicken fingers were safe. We thought wrong. When she brought them out, they were CLEARLY simply old ones thrown back into the frier. We legitamately could not bite into them without pain in our mouths and when breaking them open, the chicken was extremely dehydrated. Needless to say, we just left feeling sick to our stomachs. And I thought "Chopsticks" was bad..
Is this the same Panda Garden of South Portland origin? I have never flamed on the internet before but here goes my delivered food assay- The schezuan style been curd is soup-like, but not in a good way. This dish did not come with rice that one would expect if a dish were skewed in such a soup-like direction. Veggie fried rice was ordered seperatly due to a $20 min delivery order, and it got the main course poured over it (still not good). Crab Rangoons are heavy in every sense of the word, and crab should not be included in the description of the product. Heavy fried things and go to American-Chinese staples type place.